Now, it is not often that events in the North make headlines in the rest of the country although they regularly did, ten years ago, when the war against the Liberation Tigers of Tamil Eelam (LTTE) was at its peak. Last week however, the North again ground to a halt as ‘hartals’ were held in support of Northern Provincial Council (NPC) Chief Minister C.V. Wigneswaran. Chief Minister Wigneswaran was embroiled in a spat with his party, the Tamil National Alliance (TNA) and particularly with its leader, Leader of the Opposition, R. Sampanthan. While the latest dispute which has now been resolved- at least for the time being- has been the most divisive among their differences, the parting of ways between the veteran politician and the former Supreme Court judge had been in the making for some time. The NPC came into being only in 2013, although provincial councils were created in the rest of Sri Lanka in 1987 under the Indo-Lanka Accord. That is because, under the Accord, the Northern and Eastern provinces were merged, forming the North-Eastern Provincial Council. Elections were held once to this merged provincial council in 1988 and won by the Eelam Peoples’ Revolutionary Liberation Front (EPRLF) led by Varatharajah Perumal who became its Chief Minister. In 1990, Perumal chose to proclaim a Unilateral Declaration of Independence (UDI). In response, then President Ranasinghe Premadasa dissolved the North Eastern Provincial Council and imposed direct rule from Colombo and this is how the region was administered for decades. In 2006, the Janatha Vimukthi Peramuna, which had campaigned for many years for a de-merger of the Northern and Eastern provinces, petitioned the Supreme Court which ruled in its favour, declaring that the decision taken by then President J.R. Jayewardene to merge the two provinces was null and void. The North Eastern Province was formally de-merged into the Eastern and Northern provinces on January 1, 2007. Subsequently, elections to the Eastern Provincial Council were held in May 2008 but polls could not be conducted in the North because of the war with the LTTE. Although the war ended in May 2009, it took the then government four more years to conduct elections in the North. When polls were called, it was obvious that the Tamil National Alliance (TNA), a broad coalition of political parties including the Illankai Tamil Arasu Kachchi (ITAK), Peoples’ Liberation Organisation of Tamil Eelam (PLOTE), Tamil Eelam Liberation Organisation (TELO) and EPRLF, would sweep the board. Hence, whoever was nominated as its chief ministerial candidate would become the Chief Minister. Mavai Senathirajah, a veteran politician in the TNA who had spent his political life serving the region in various capacities and had been a parliamentarian since 1989 was the obvious choice. However, TNA leader R. Sampanthan prevailed on him to make way for C.V. Wigneswaran, a political neophyte but a much respected and recently retired judge of the Supreme Court, at the time. 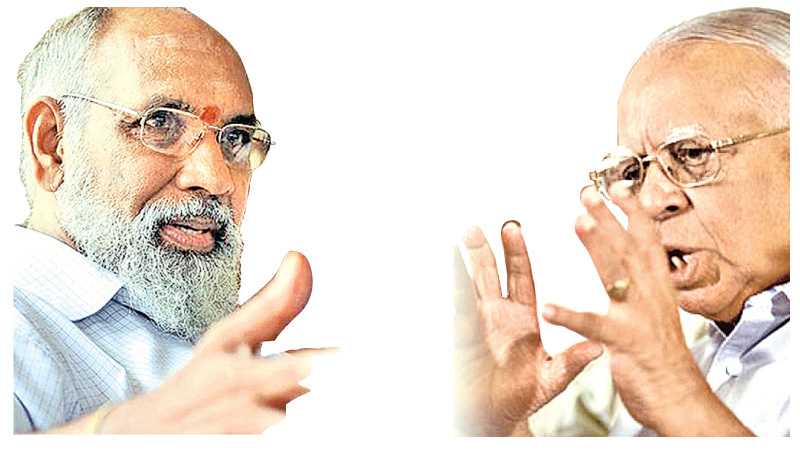 Sampanthan felt that Wigneswaran’s legal expertise would be of immense value for the NPC, in dealing with Colombo. Canagasabapathy Visuvalingam Wigneswaran who was born in Colombo, in Hulftsdorp, the seat of all legal activity although his parents hailed from Manipay. Perhaps this was why he was called a ‘southerner’ by his opponents during his election campaign. As his father, a public officer, was transferred frequently Wigneswaran schooled in Kurunegala and Anuradhapura before attending Royal College, Colombo. Then he entered the Colombo University and the Law College. When he ended his academic career he had earned a Bachelor of Arts from the University of London, a LLB from the University of Ceylon and passed his Proctors and Advocates exams at Law College. The story has been told of how Vasudeva Nanayakkara, the President of the law Students Union in 1961, had to persuade a reluctant Wigneswaran to contest the union elections the following year. Wigneswaran did, and won. Decades later, Nanayakkara’s daughter was to marry Wigneswaran’s son. Out of law school, a promising career in law beckoned for Wigneswaran. He practised law for over fifteen years before deciding to take up a career as a judge. Joining the judicial service in 1979, he initially served as a magistrate and District Judge in Batticaloa, Chavakachcheri and Mallakam. Justice Wigneswaran was appointed to the High Court in 1988 and served in the Northern, Eastern, North Central, Uva and Western provinces. He was appointed to the Court of Appeal in 1995. He was elevated to the Supreme Court in March 2001. Justice Wigneswaran retired in October 2004. Wigneswaran was one of the few retired judges who lent their voices against the impeachment of Chief Justice Shirani Bandaranayaka. This was in keeping with the high profile he maintained after retirement, often commenting on social and political issues and earning regular headlines. He is fluent in Tamil, English and Sinhala. The elections, as expected, returned a landslide win for the TNA which garnered 84 per cent of the vote. The TNA secured 30 of the 38 seats in the NPC. Wigneswaran was duly appointed the first Chief Minister of the Northern Province in September 2013. The latest crisis in the NPC did not however occur overnight- trouble had been brewing within the TNA, especially after the Chief Minister acted unilaterally on a few occasions. The relationship between Wigneswaran and his party had been strained for some time because of this. There appears to be ideological differences between Opposition Leader Sampanthan and the Chief Minister as well. Sampanthan, now 84 years of age, commands huge respect across the political spectrum. He belongs to an earlier generation of Tamil political leaders and many see him as the last among the moderates with whom Colombo could have a reasonable dialogue in addressing ethnic grievances. Wigneswaran on the other hand is viewed as more hawkish, playing to gallery of Tamil nationalist sentiment from time to time. He has always been outspoken but his actions have been brash at times, not having the political nous required for the job, possibly because he lacks the experience of a career in politics. The recent dispute evolved into a full scale crisis after Wigneswaran investigated four ministers of the NPC. Two ministers- Thambyrajaha Gurukularajah and Ponnuthurai Ayngaranesan- were found guilty while two were exonerated. Sampanthan wanted the two exonerated ministers, Provincial Health Minister P. Sathyalingam and Provincial Civil Transport and Fisheries Minister B. Denishwaran re-instated but Wigneswaran wanted a fresh probe into them and was insisting that they be suspended until the new inquiry was concluded. Matters came to a head when the ITAK faction of the TNA moved to sponsor a motion of no-confidence against Wigneswaran. ITAK appeared to have mustered the support of 21 members of the 38-member NPC. Had the motion been approved at the NPC, Wigneswaran would have lost his position. Significantly, the PLOTE, TELO and EPRLF factions of the TNA supported Wigneswaran in this political stand-off. Together, they command 14 seats in the NPC. These factions were accusing the TNA of colluding with opposition parties in the NPC to oust Wigneswaran because the ITAK by itself had only 15 seats in the Council. Ultimately sanity prevailed and a compromise was reached. This followed hectic rounds of negotiations between TNA parliamentarians and even intervention from Hindu and Catholic religious leaders in the region. It appears that Wigneswaran has blinked first because he has agreed to let the two ministers at the centre of the controversy to continue work until their second inquiry was completed. The ministers, in turn, have undertaken not to interfere with the probe. The ITAK has agreed to withdraw the motion of no-confidence against Wigneswaran. This is indeed a welcome outcome not only for the TNA but for Colombo as well. That is because, had the TNA split into various factions, Colombo would have to deal with a multitude of political groups in the North in dealing with questions relating to the devolution of power- and that would be much more challenging than dealing with the single entity that is the TNA. However, the big question is whether it could be said that ‘all’s well that ends well’ in the political theatre in the North. Many in the TNA now view Wigneswaran as the man who betrayed the trust placed in him by their leader, Sampanthan. Sampanthan did so, sacrificing Mavai Senathirajah in the process, a prospect Senathirajah then magnanimously accepted as he believed it would be in the best interests of the TNA. Now, both Sampanthan and Senathirajah- as well as many other TNA stalwarts- may well rue their decision. It remains to be seen where the TNA will progress to, from here. It is hoped that Opposition Leader Sampanthan and Chief Minister Wigneswaran can let bygones be bygones and work together because their partnership will be crucial not only for the NPC but for the country as well, as the nation seeks to resolve a multitude of ethnic grievances, enact constitutional changes and facilitate reconciliation.